In a small Wisconsin town, Ralph Truitt, a wealthy business man, places an advert in the papers for a reliable wife. After carefully reviewing the applicants, he finally selects Catherine Land. Now he waits in the bitter cold for her train to arrive. But when she disembarks, Truitt sees that she looks nothing like her picture. And so begins a relationship fraught with deception. This is a novel of bad and broken people trying to find hope in each other. It’s a sad story, set in a bleak and unwelcoming landscape. It was difficult reading at times, with characters I couldn’t help but like despite knowing that I shouldn’t, doing things I know I should disapprove of. The writing style was excellent, very accessible. It’s always lovely to be able to focus on the story without having to worry about meandering sentences. The characterisations were excellent. I really felt as though I were getting to know Catherine and Ralph, as though they were real people with complex goals and emotions that exist independently of the author. This is a fantastic book to read on a cold wintry day! 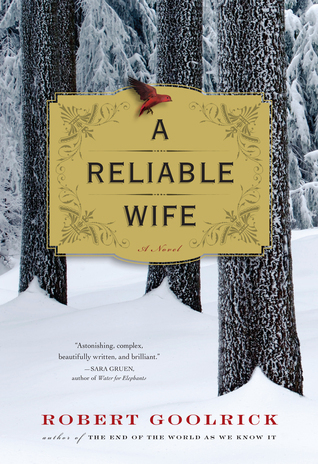 Sign into Goodreads to see if any of your friends have read A Reliable Wife.